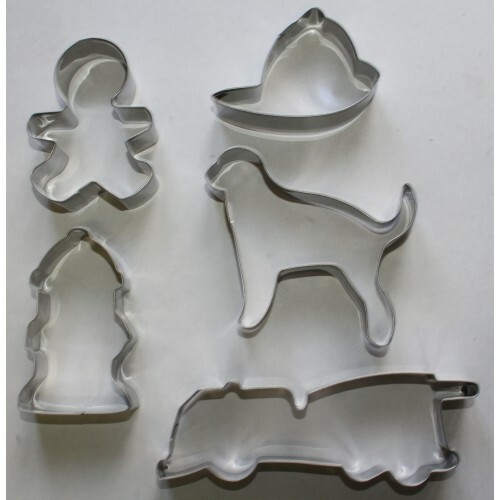 Fireman Cookie Cutter Set includes cutter of a Dog (9cm W x 8cm L), Fireman Hat (7cm W x 5.5cm L), Fire Truck (13cm W x 5cm L), Gingerbread Boy (6cm W x 8cm L) and Fire Hydrant (5cm W x 8cm L). This 5 piece set is made from stainless steel and will not rust. Cookie dough receipe is included. Use this Outer Space Cookie Cutter Set to make imaginative outer space sandwiches or out of this wor..
As an essential part of your fireman themed birthday party, these fireman cupcake cases are supplied..
Use this gingerbread man 5 piece stainless steel cookie cutter set to make interesting lunch box san..
What little girl would not love a fairytale birthday party. With this set of princess cookie/biscuit..
Use these Jungle animals stainless steel cookie cutters to make biscuits or great lunch box sandwich.. 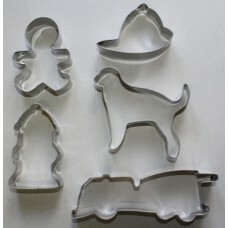 This stainless steel cookie cutter in the shape of a pigs head may be used to create sandwiches for .. This mini stainless steel cookie cutter is in the shape of a very famous pigs head. Perfect for maki..